in the absence of any objective means of recognizing efficacious products, veterinarians and the public may be confused by the "noise" in the plaque and calculus retardation market. A full-day meeting on veterinary dental product endorsement was held under the sponsorship of AVDC in 1991, which included presentations by representatives of AAHA (American Animal Hospital Association), ADA (American Dental Association), AVMA (American Veterinary Medical Association, including discussion of the relevant AVMA ethics policies), and the US Food and Drug Administration - Center for Veterinary Medicine (FDA-CVM). The need for a system was acknowledged, with concerns expressed with regard to conflict of interest and other ethical issues, financial and liability implications, and need for credibility. Further discussion continued under the sponsorship of the University of Pennsylvania, and a 2-day meeting of a Consultant Panel was held in Philadelphia in 1994. The panel of 35 veterinary dentists, dental scientists, and representatives of relevant organizations included the American Dental Association (sponsor of the ADA Council on Dental Therapeutics "Seal of Acceptance" system), AVMA and AAHA. The Consultant Panel reached a consensus to develop a product review and acceptance system. At gthis meeting and a second meeting early in 1995, a protocol was agreed upon for testing effectiveness of plaque and calculus retardants in dogs, and confidentiality and conflict-of-interest statements were adopted. The Consultant Panel members were polled for input on suitable names for the entity, and "Veterinary Oral Health Council" (VOHC) received the most support. Representatives of the USA FDA Center for Veterinary Medicine (FDA-CVM) attended one of the Consultant Panel meetings and were sent copies of all Consultant Panel and VOHC correspondence during the start-up period. The FDA position was that it encouraged the establishment of a credible independent review system for veterinary dental products, recognizing that FDA does not have the resources to review and regulate dental efficacy aspects of these products. In correspondence with FDA, the Consultant Panel noted that the VOHC system is limited to dental efficacy review, with no regulatory function. Click FDA statement and then scroll down to view the FDA statement on Dental Products. A proposal developed by the Consultant Panel was made to the AVDC Board of Directors, which voted to endorse the VOHC concept. The Board appointed an ad-hoc committee (Jamie Anderson, Ben Colmery, Paul Cleland and Colin Harvey) to develop a business plan and set up operating procedures based on the work of the Consultant Panel. The recommendations of this committee were adopted by the AVDC Board on April 27 1997, thus establishing the VOHC as an organization within AVDC. The initial Council members appointed by the AVDC Board were C. E. Harvey (VOHC Director), J. Anderson, L. Braswell, L. DeBowes, C. Gorrel, J. Hefferren, S. Holmstrom, K. Lyon, and G. Stookey. Click Conflict/Confidentiality to view the VOHC Conflict of Interest and Confidentiality statement. The "official" launch of VOHC took place during the 1997 Veterinary Dental Forum meeting in Denver, and was followed by an open meeting on November 3rd, 1997. Initially, a protocol for products that retard plaque mechanically and calculus (tartar) mechanically or chemically was published. A protocol for cats was added in 1998, and a protocol for chemically-active anti-plaque agents in dogs or cats was added in 1999. A formal policy on awarding the Seal to multiple products in a 'product line' was adopted in 2003. 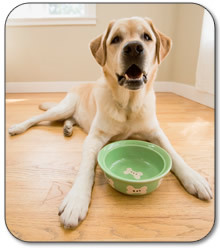 The first VOHC Seal of Acceptance was awarded in June 1998, to Hill's Pet Nutrition Canine Prescription Diet t/d. Click Products to view the full VOHC-accepted Product List. Use of the VOHC outside the USA began in Canada, followed by Europe and Japan. The VOHC system is now recognized world-wide. Feedback on the VOHC system and questions about or suggestions for improvement in the VOHC process are welcome. Contact VOHC.